Perfect, crusty French bread. Which is better? The crusty, chewy outside? The soft, delicate inside? The combination together? Whatever your choice, this recipe is fabulous. I love it warm smothered with butter. This recipe isn’t hard. Even though it’s homemade bread, it’s straight-forward. But as with all bread, don’t be discouraged if your first loaf isn’t perfect. I’ve included step-by-step pictures of every single step. Just so you can get an idea of how it will look at each step of the progress. 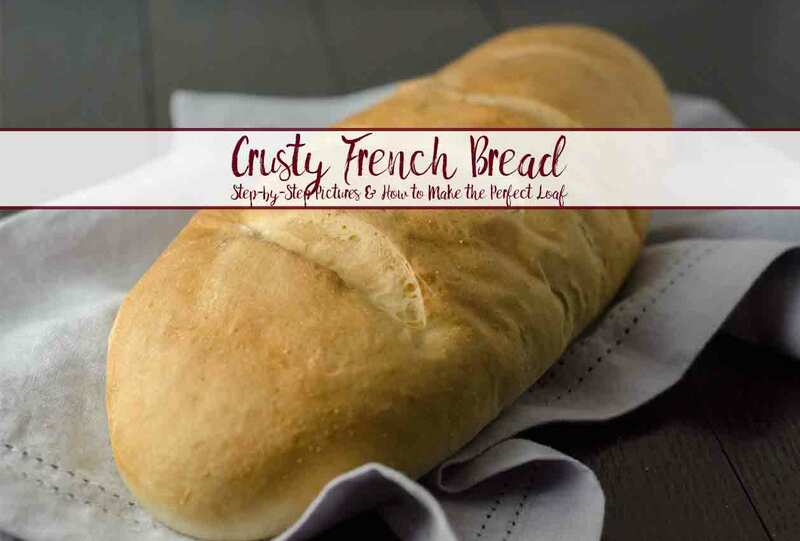 There are tips below for the perfect loaf of French bread! If you’re looking for more fabulous bread, you can check out “Perfect Traditional Homemade White Bread” -or- “Perfect Homemade Wheat Bread“. Both include pictures, printable recipe, and…they both work great for sandwiches! And the tips and tricks that lead to perfect French bread. 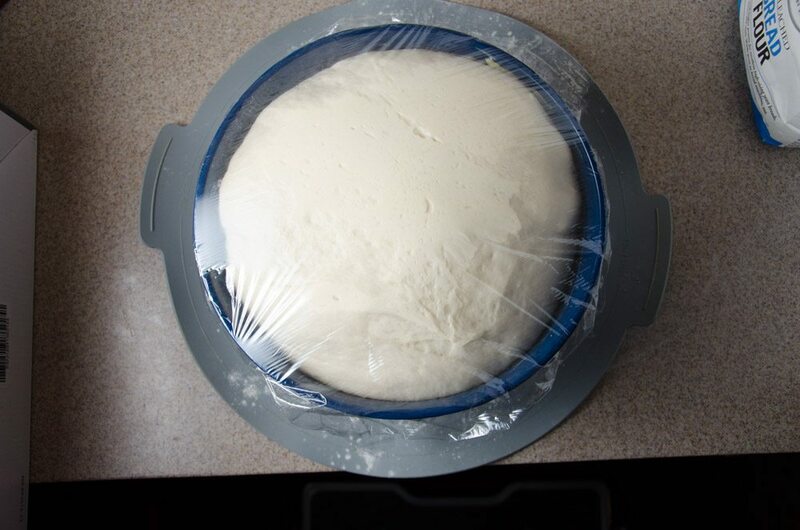 • The first is resting the dough partway through the kneading before the first rise. I’m not sure why this has such a great effect. But the dough rests for 7 minutes. 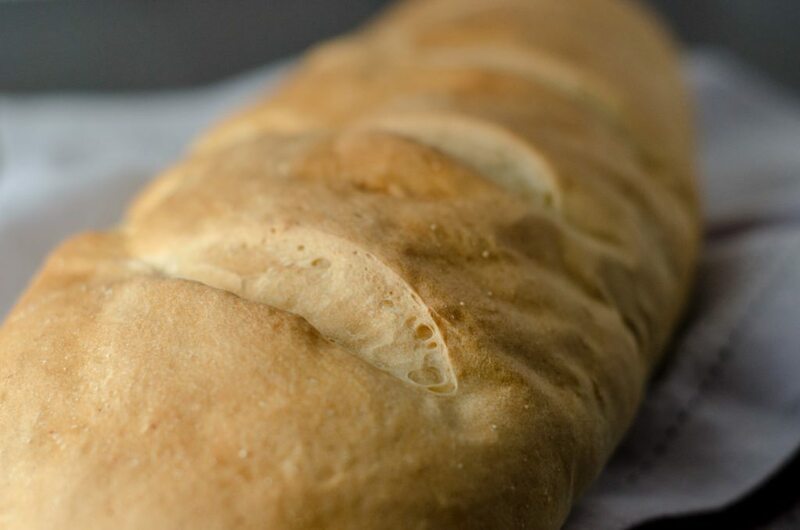 • The texture: veteran regular bread makers might be surprised that you leave French bread a little sticky and softer. • Covering with plastic wrap during the rise. Most bread you just leave open to air or cover with a damp towel. • Finally, you MUST use a steam pan. You place an empty metal pan in the oven during pre-heating. Then, when you put in the bread to bake, dump 2-3 cups of ice cubes into the pan. The steam is the key to the perfect chewy crust. 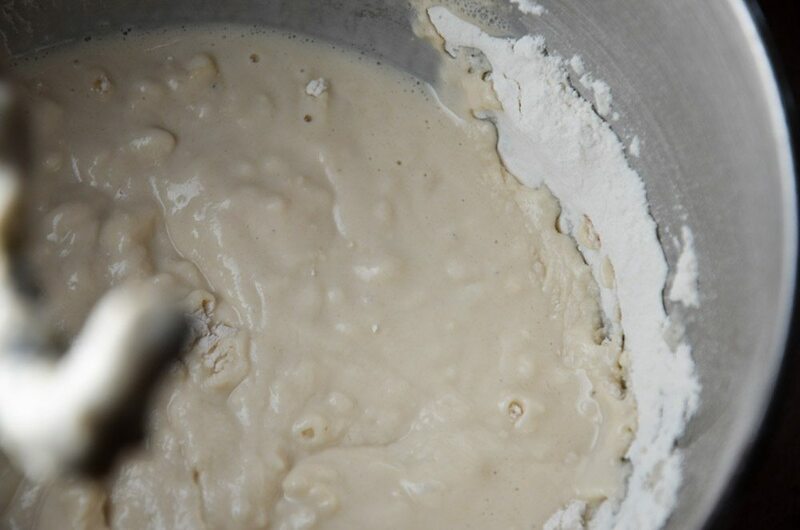 Combine the yeast, sugar, and 1/2 C. hot water in the bowl of a stand mixer. Let proof for 5-10 minutes. 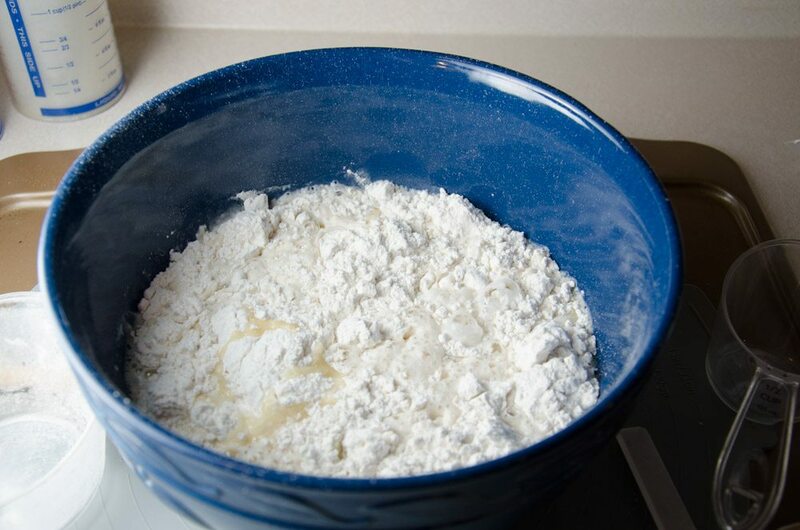 In a separate bowl, combine remaining hot water, melted butter, salt, and 3 cups of flour. 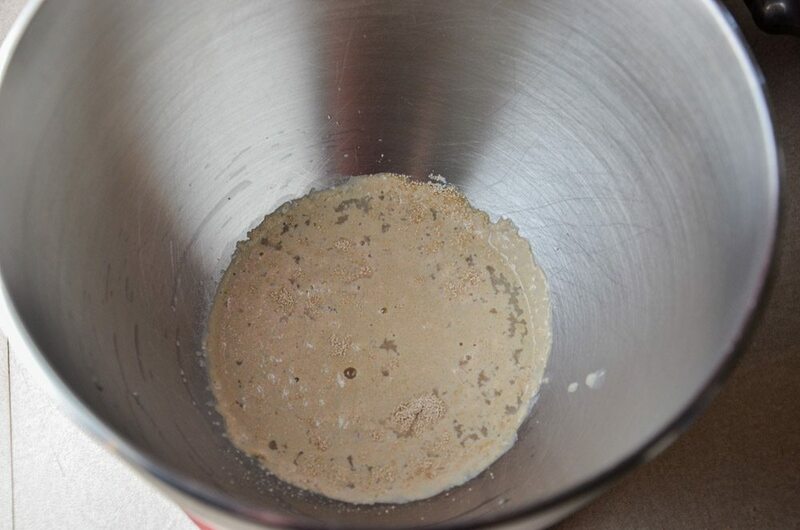 Add mixture in bowl to yeast. Knead on speed 2 for 1 minute. 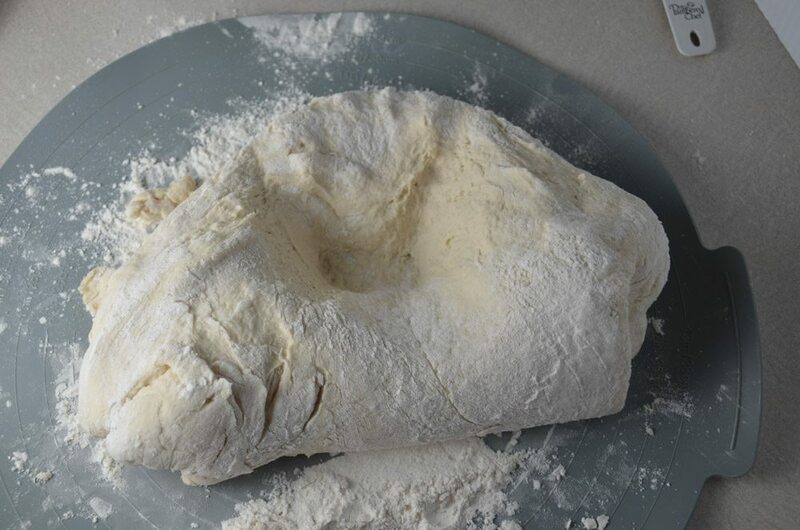 Add remaining flour 1/2 cup at a time, kneading between each addition. At first the mixture will be very wet. Continue to add flour 1/2 cup at a time. 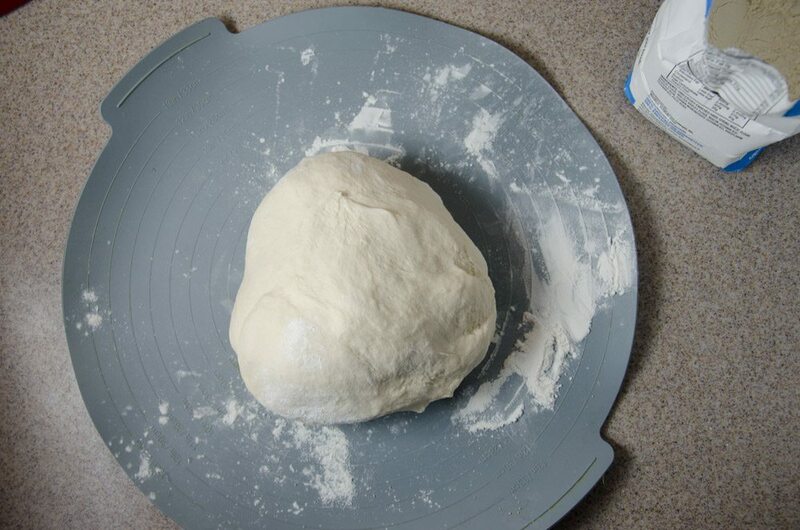 As you add flour, the dough should start to stick to the hook and pulls away from bowl. 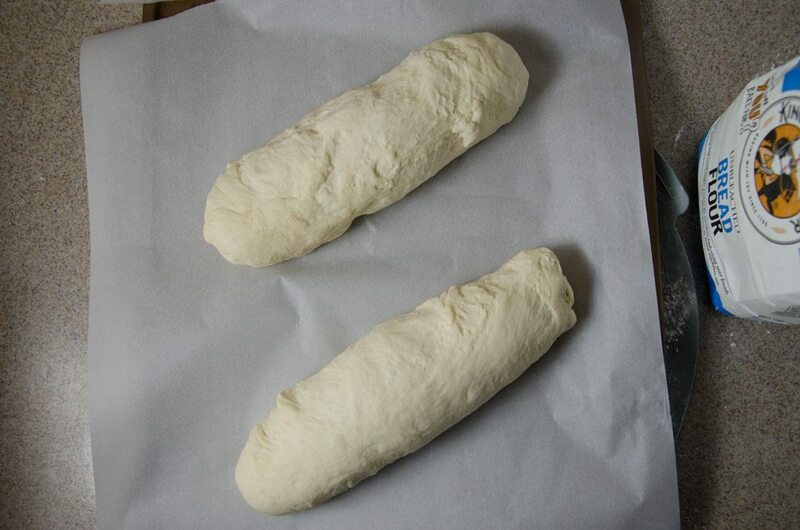 Dough will become thicker and stick to dough hook. (Note the texture of the dough). Let rest for 7 minutes. During this time, grease a large bowl. 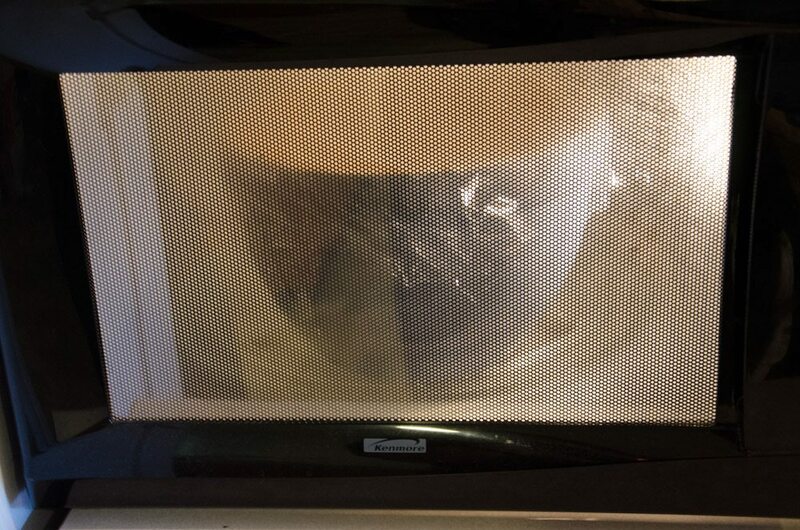 [If using microwave for first proof, start heating 2 cups of water on high to create a warm, steamy environment]. Knead again for 3 more minutes. (Add flour if needed). Form into a tight, compact ball. 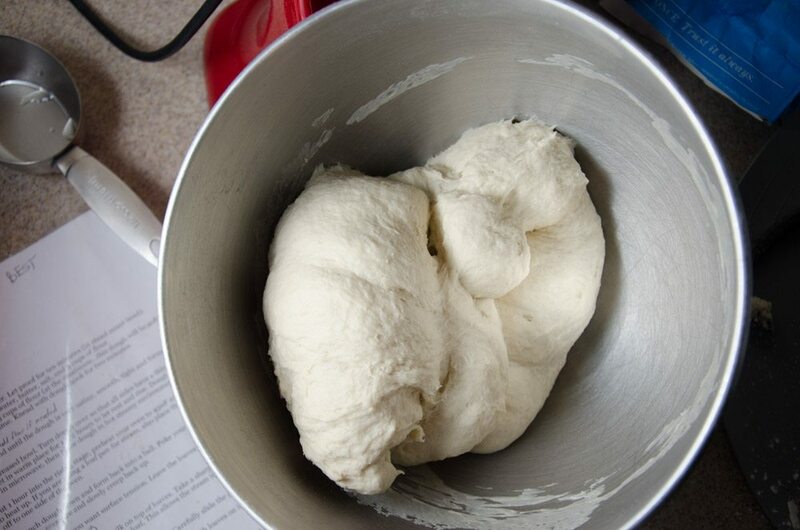 Place dough in previously greased bowl. Turn dough over so all sides have thin coating of fat. 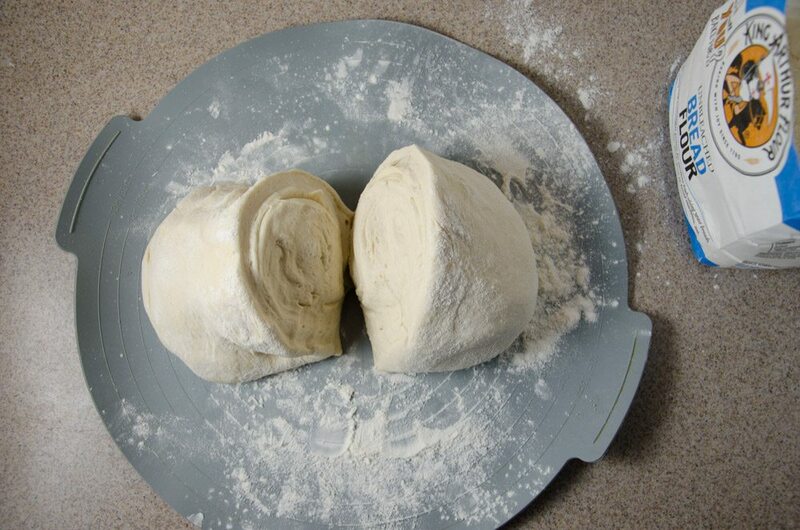 After dough is doubled in size, punch down dough. Knead 1-2 minutes on a lightly floured surface. To knead: first push down in the middle of the ball with the heel of your hand. Rotate 90 degrees. Fold in half (lift bottom half up and fold it over top half). Again, push down in the middle with the heel of your hand. Notice it becoming smoother as you knead. After kneading, when you poke your finger into the surface, it should give into the pressure and slowly creep back up when you remove finger. Then form dough into a ball. Cut in two. Pre-heat oven to 450°. Place a small pan (for steam) in the oven to heat (below the rack bread will cook on). Normally, place loaves onto large baking sheet that has a tiny bit of cornmeal sprinkled across the surface. Allow to rise 30 minutes. (This pic has them on parchment paper...I was testing various loaves.) When dough is risen, carefully brush milk on the top of the loaves. With a sharp knife, make 3-4 shallow diagonal slashes across the top of the loaf. (This allows some steam to escape so it expands evenly during the baking process). Slide pan into pre-heated oven. Dump 2-3 cups of ice cubes into pre-heated steam pan. Bake 20-25 minutes (cover with foil after 10-15 minutes if needed to prevent over-browning). 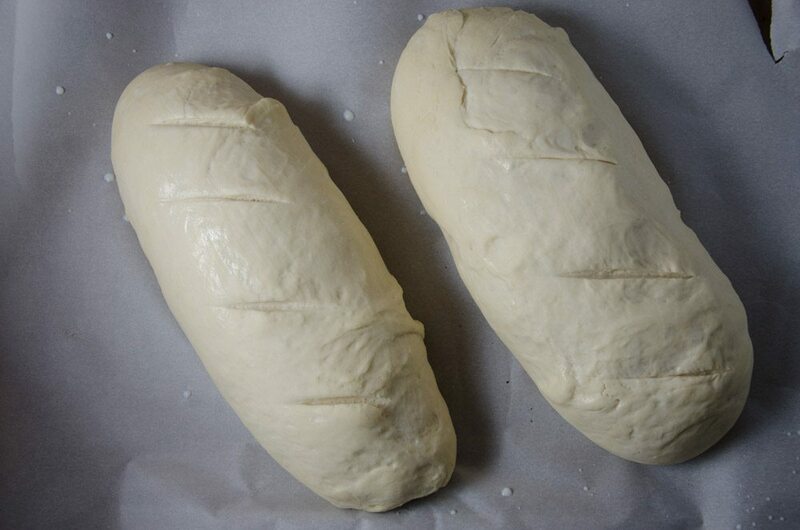 Notes: IF USING BAKING STONE- After 1 hour into first rise, place stone in oven and start pre-heating to 450°. When ready to cook (after second rise), remove heated stone from oven. Sprinkle generously with cornmeal. Carefully transfer loaf from counter onto stone. Follow baking instructions above. Combine the yeast, sugar, and 1/2 C. hot water in a small bowl. Let proof for 5-10 minutes. 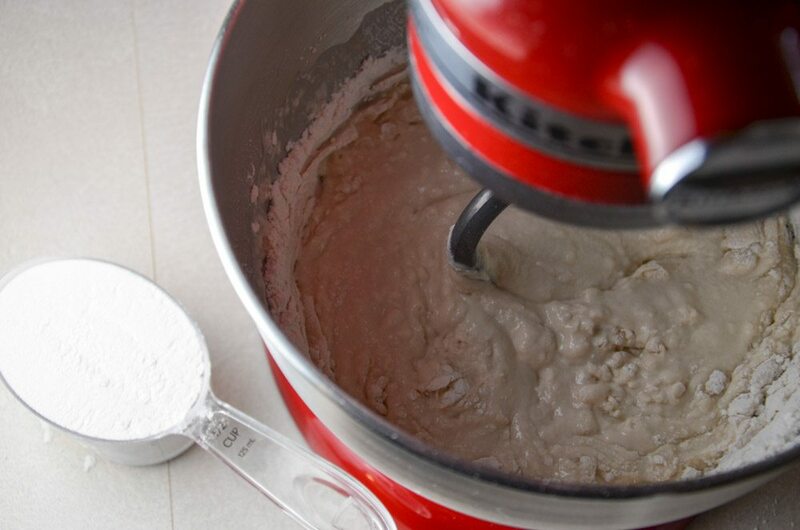 In the bowl of a stand mixer, combine remaining hot water, melted butter, salt, and 3 cups of flour. Mix well. 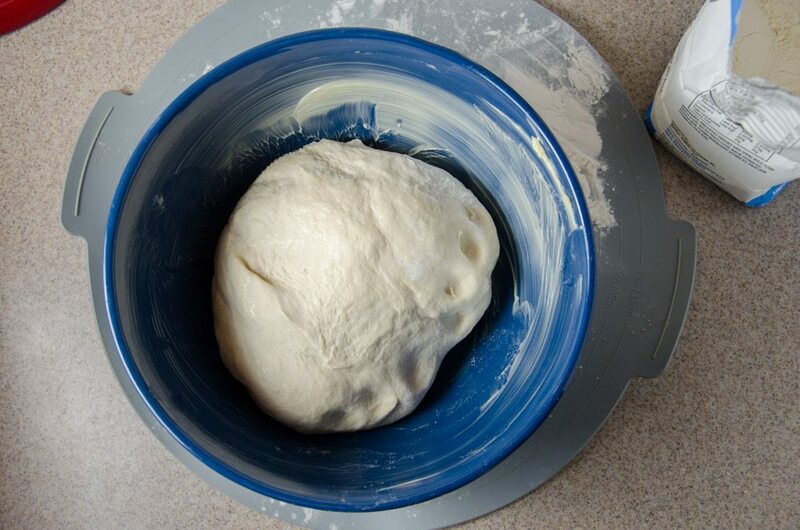 Add remaining 3 cups of flour (at the maximum, this dough will be softer and stickier than regular bread), 1/2 cup at a time, kneading between each addition. 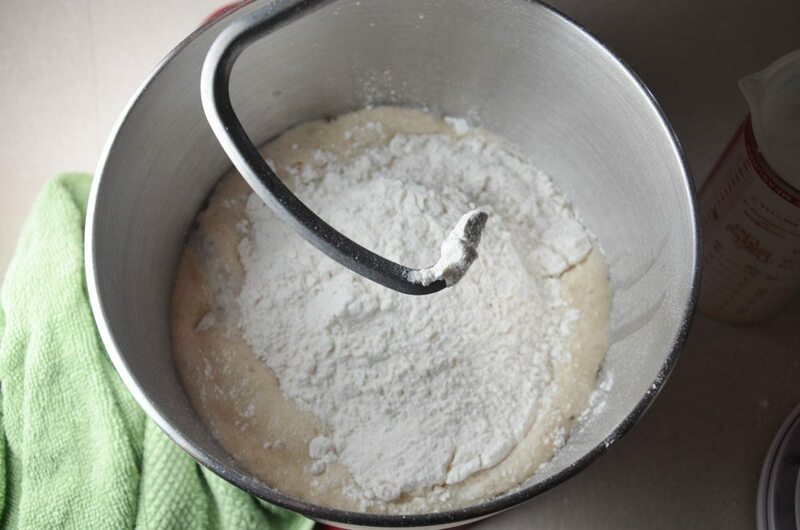 The dough should stick to the hook and pulls away from bowl. 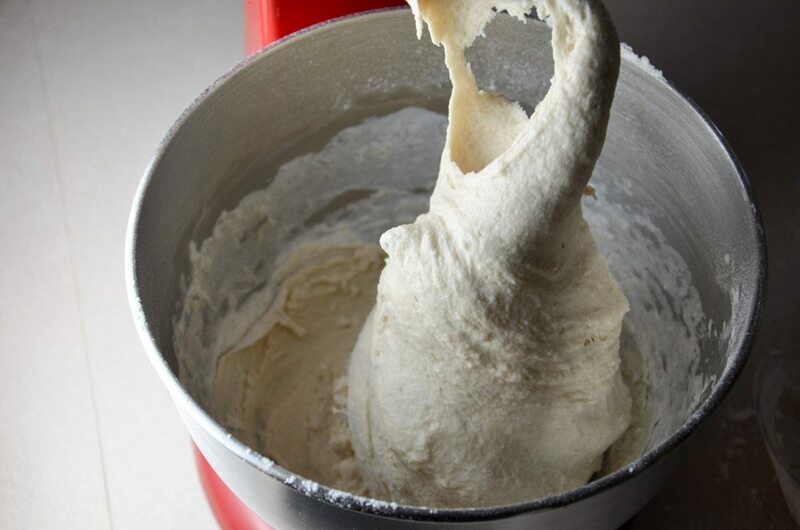 Knead with dough hook for 2 minutes. Let rest for 7 minutes. During this time, grease a large bowl. [If using microwave for first proof, start heating 2 cups of water on high to create a warm, steamy environment]. 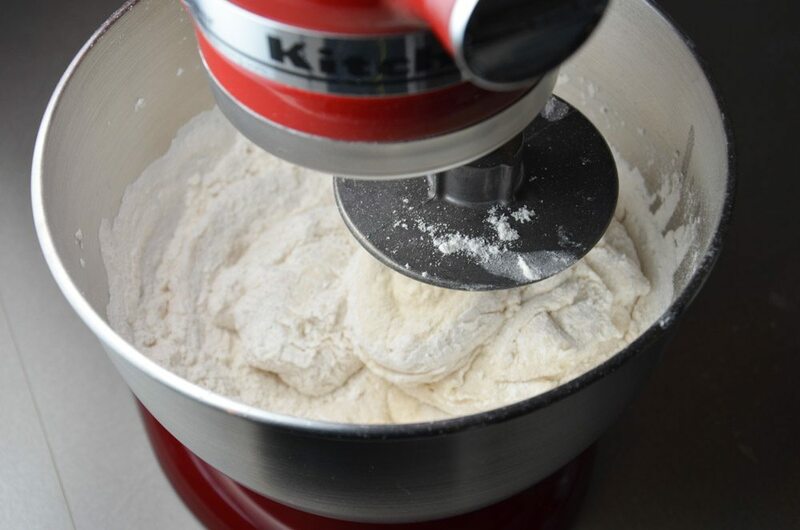 Remove from mixer and knead by hand until the dough is very satiny and smooth (approx. 1-2 minutes). Form into a tight, compact ball. 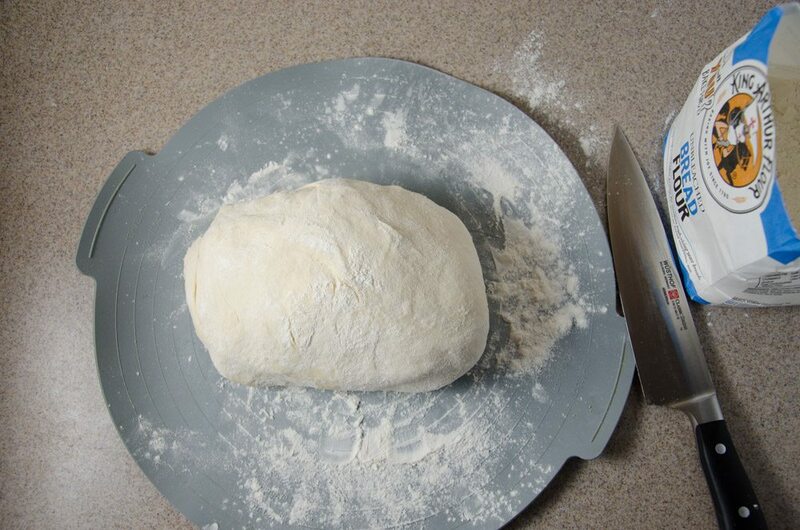 After dough is doubled in size, punch down dough. Knead 1-2 minutes on a lightly floured surface. When you poke your finger into the surface, it should give into the pressure and slowly creep back up when you remove finger. Form into a ball. Cut in two. Pre-heat oven to 450°. Place a small pan (for steam) in the oven to heat (below the rack bread will cook on). Form each half into a tight loaf. You need surface tension. Place loaves onto large baking sheet that has a tiny bit of cornmeal sprinkled across the surface. Allow to rise 30 minutes. When dough is risen, carefully brush milk on the top of the loaves. With a sharp knife, make 3-4 shallow diagonal slashes across the top of the loaf. (This allows some steam to escape so it expands evenly during the baking process). 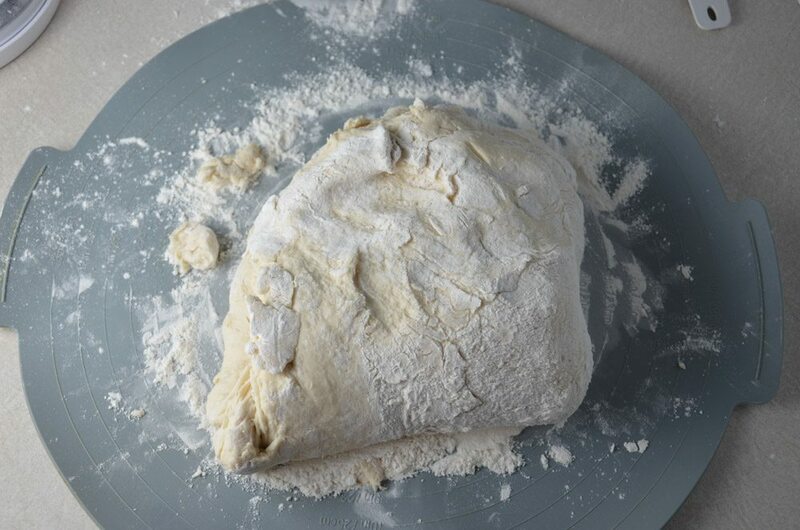 IF USING BAKING STONE- After 1 hour into first rise, place stone in oven and start pre-heating to 450°. When ready to cook (after second rise), remove heated stone from oven. Sprinkle generously with cornmeal. Carefully transfer loaf from counter onto stone. Follow baking instructions above.